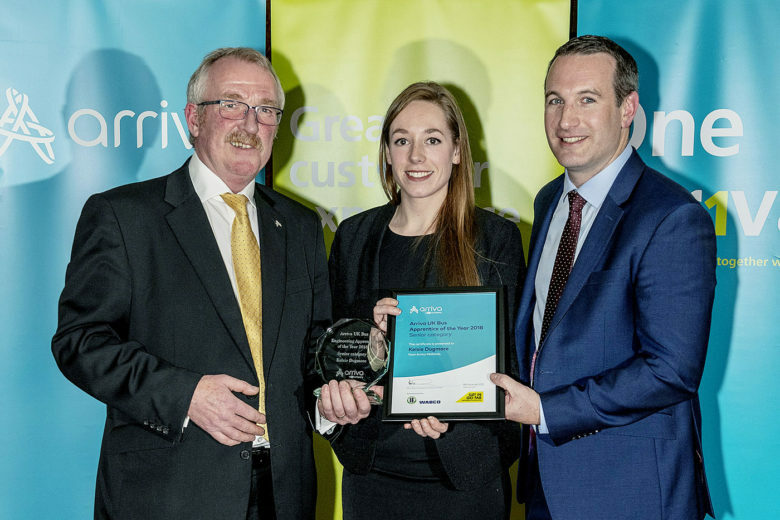 Imperial’s Sales Director John Dwight is pictured presenting the Engineering Apprentice of the Year 2018 Senior Award to Kelsie Dugmore, alongside Mark Bowd, Engineering Director for Arriva UK Bus (left). Now in its sixth year, the annual Arriva UK Bus Engineering Apprentice Awards saw an evening of celebration and recognition of the achievements of some of the UK’s brightest engineering talent within the PSV sector. The event was attended by apprentices from each of Arriva’s operating companies as well as the Engineering Directors from those locations and Mark Bowd, Engineering Director for Arriva UK Bus. John Dwight, Imperial Engineering’s Sales Director, awarded prizes to both the winner and runners-up of the Senior Category, which was sponsored once again by Imperial, reflecting the importance that the company places on bus apprenticeships and training. Demonstrating its commitment to training engineers of the future, Arriva UK Bus opened a new apprenticeship academy in Derby in 2017, in addition to academies in St Helens and London. Operated by Arriva Midlands, the academy recruits a dozen students per year who follow a four-year apprenticeship. The academy is also developing as a centre of excellence for staff across the business, offering engineers the opportunity to up-skill with continuous professional development training and bespoke courses devised by Arriva UK Bus and vehicle manufacturers. Leading PSV parts distributor, Imperial Engineering, has been an advocate of bus apprenticeships for several years. The company actively supports apprentice training by organising training sessions with its OEM suppliers, such as Knorr-Bremse, Haldex and Wabco for customers including Arriva UK Bus, Go Ahead, London United and Metroline, as well as the provision of training materials. Most recently, Imperial has completed the manufacture of three pneumatic disc brake training rigs commissioned by Arriva. OE bus and coach parts supplier, Imperial Engineering, has been distributing premium quality parts for over 50 years. The company is a primary distributor for Knorr-Bremse bus parts, Wabco, Haldex and Meritor and only sells brand new OE products, providing customers with the assurance that they are fitting the highest quality components. Imperial Engineering offers a wide range of bus and coach parts, including braking and friction products, propshafts, steering components, water pumps and turbochargers.